Lidar data for the Upper Mississippi River System (UMRS) were collected from 2007 to 2011 by the US Army Corps of Engineers (USACE), Upper Mississippi River Restoration (UMRR). The bathymetry data for the UMRS was collected from 1989-2010. While both datasets are used for essential analyses separately, in many cases combining lidar and bathymetry datasets can be valuable. When combining lidar and bathymetry datasets the final product is considered a topobathy dataset served as a raster. The topobathy single surface model is important for examining different ecological processes that occur across aquatic and near shore areas. Possible target audiences for this dataset are floodplain management groups, scientists, federal and state agencies, and local offices for technical applications. A systemic topobathy surface is essential in understanding river ecosystems, as well as habitat restoration planning, landscape modeling, and research of the ecology of floodplain communities. Merging bathymetry and lidar is also beneficial for predicting elevation of near-shore aquatic areas that often lack data due to shallow waters. Figure 2. Main datasets used to develop a topobathy surface. Topographic lidar is generally collected for land-based studies and bathymetry data sets are collected for water level and depth purposes. Because both datasets are collected for different purposes they consequently have different datum references. 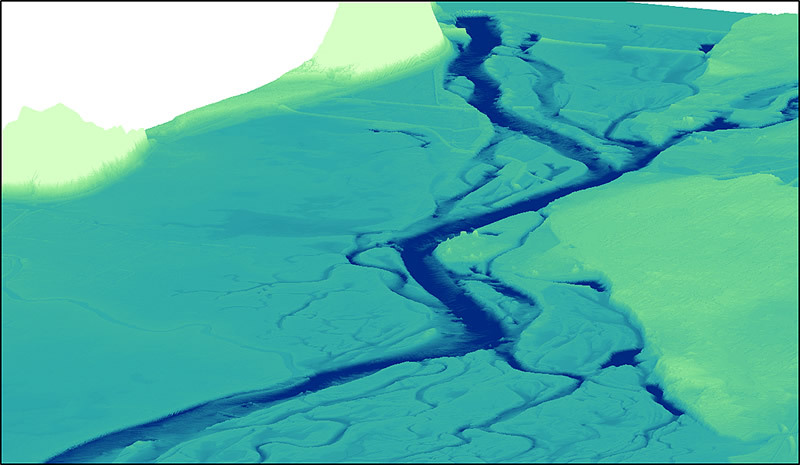 VERTCON was used in the conversion of datasets so that the lidar and bathymetry could seamlessly be combined. Also, the resolutions of each dataset need to be considered. Lidar data was collected at a 1m resolution and the bathymetry was collected at 5m resolution. To neutralize the cell resolution variations, each topobathy dataset is served as a 2m raster.